Chair styles come and go, but there are those that remain intriguing no matter how much time passes. View examples and learn more about five different types of antique chairs that can be both fascinating and functional. The curule (pronounced kyur-ool) is a style of cross-based furniture, usually a chair or stool, in which the legs consist of two curved pieces joined in the middle, like a pair of interlocked U's or a single wavy X. And yes, you've seen this type of seating on Game of Thrones along with a variation called a Savonarola chair (shown below). 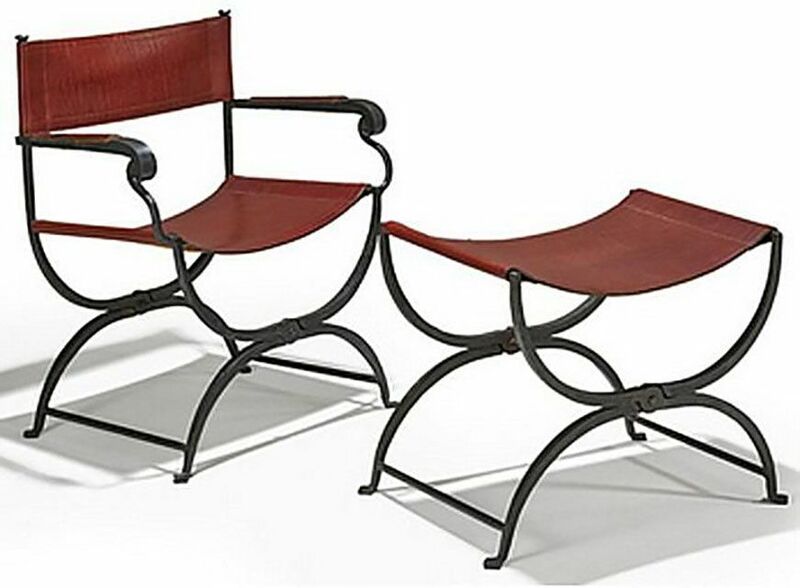 It was derived from a 6th century BC Roman seat, the sella curulis, that was backless and portable. With the rise of Neoclassical styles in the later 18th century, it was revived, featuring in Louis XVI designs and later Sheraton pieces. The curule is also characteristic of Empire and American Federal pieces, such as those designed by Duncan Phyfe, who incorporated the bent legs into chairs with tall backs. This type of chair is also sometimes referenced as a scissors chair or Grecian cross chair. The Savonarola chair is a fancier variation of the basic curule, as is the Dante chair. Developed in the early 18th century, corner chairs are typical of antique furniture pieces that could save space by nestling easily into a corner. These armchairs typically have square seats and they are placed diagonally. They have one leg in front and three others that rise past the seat to support a semi-circular or curved crest rail on top. Splats or backrests are set at right angles to each other, and the legs can be straight or cabriole. Sometimes the front leg on a corner chair is more decorated than the others. They are sometimes references as roundabout chairs or writing chairs. The example shown here was owned by actress Marilyn Monroe, and used in her last photo shoot. Why is it called a gondola chair? With its sharp slope, the gondola chair in profile does somewhat resemble the prow of a gondola boat. This type of chair has a concave or C-shaped back, with sides that slope continuously down towards the seat, and splayed legs in back. Though originally applied to side chairs with open backs (like the one shown here), the term now applies to any chair, open like a fauteuil or closed like a bergère (if there are arms, they too curve dramatically forward). The back is usually conical or circular, but can also be rectangular, albeit with rounded edges. The style was developed in France circa 1760 and is characteristic of Neoclassical, Regency, and Greek Revival styles of the late 18th century through the first quarter of the 19th century. The gondola chair is sometimes referenced as a tub chair or a barrel chair, and not all examples are nearly as ornate as the piece shown here. This type of light chair, supported by two sets of saber legs flaring outward in opposite directions and connected by a curved concave back panel at shoulder height, was developed in 5th-century Greece. The klismos style was revived as part of the late 18th-century Neoclassical movement in furniture, featuring prominently in Regency, Federal, and Empire styles. Some versions, especially American, have turned front legs, either straight or tapered, in imitation of classical Roman styles. They were made for use with dining tables, and are often used as side chairs. Some examples, like the one illustrating this feature, can be heavily decorated. Other more modern versions have the same basic shape, with flared saber legs, but they are toned down in terms of the elaborate detailing. This chair style has also been used as a prop on Game of Thrones. The Savonarola is a kind of X-frame chair, in which two legs, sometimes composed of multiple slats, cross each other and rise to form the arms creating the silhouette of a wavy X. The Savonarola style was developed in the late 15th century to early 16th century Italy. It was originally a folding, portable adaptation of the ancient Roman curule (see above). The difference is that it has more angular legs and the addition of a low back. The wood was sometimes carved or inlaid, and later Renaissance Revival versions in the 19th century often featured high backs and even more ornate carving or some type of inlay. As they grew increasingly ornate, Savonarola chairs lost their portability and became more like massive thrones or chairs of state. These chairs are sometimes referenced as Dante chairs (often simpler variations), scissors chairs, X-frame chairs, or by the more generic term curule. Special thanks to Troy Segal, contributing writer, for her assistance with this article.